A million years ago, I started a makeover of a guest room / room for my daughter when she came home from college on the weekend. This was how you last saw it as it was in progress, in a post where I was talking about creating a visual flow between rooms. The walls had been painted (the beautiful gray color is Studio Taupe from our living room, but lightened with white.) and we were getting ready for new carpet. That, my friends, was over a year ago! How does time fly? Long time no see, but I’m excited to finally show you some progress today, namely the addition of our new library bookshelves (as you can see, there has been more completed in the room and I will update you on in detail on in an upcoming post. I promise you won’t have to wait as long this time!). But secretly, I call it MINE. Haha. I LOVE it. One thing I really wanted in this room was bookshelves. As I’ve mentioned in other posts, we love books. Just as I love the open shelves in my kitchen, where I can keep cookbooks or have fun with accessories, I want to have bookshelves in several rooms of the house. I not only love the look of bookshelves, I love how practical they are in making the most of a space. Built in bookcases are a match made in heaven for me. But for my realistic budget of time and money, ready to assemble bookcases were a perfect compromise! We found ours from the awesome Threshold line at Target online and they were delivered to our door. My husband put them together for me. They are three separate bookcases, but side by side they form the look of one! No modifications necessary! We are super happy with how the bookcases turned out and their contribution to a room I now LOVE being in. I feel like we just gained an extra room! Plus, the best part of this was that everything on the shelves was already in our house! That means I didn’t have to go buy anything new to fill them up, I just had to shop in my other rooms. DOUBLE BONUS! 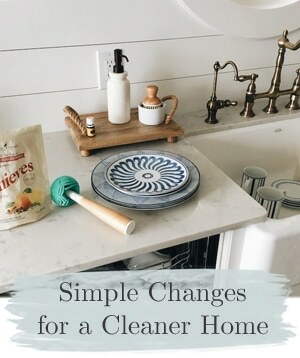 Amazing how much stuff ends up all over the place without a designated home — it has been a long time dream to be able to add more usable space without adding on or moving out! It feels great to finally find a new home for wayward books and accessories and have the room to add to our collection if we want to. I’ll share more of this room makeover soon, it is now one of my favorite rooms in the house. Little by little our house is getting de-junkified, more organized, and we are on our way to making the most of the space we have! NOTE: I can’t wait to show you how our son’s room is coming along (my next update for you will be THIS WEEK!) We couldn’t be more excited to be making so much progress on the bedrooms. 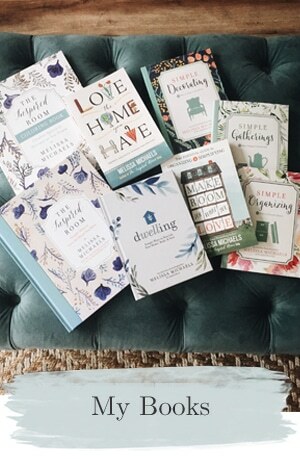 This post on our home library is published in partnership with one of my favorite places to shop, Target! I received a gift card in exchange for sharing about their great library program (below), but my post and room are my own. Target is transforming 16 school libraries as part of The Target School Library Makeover Program, an initiative that breathes new life into elementary school libraries across the country. By reimagining school libraries and transforming outdated spaces into state-of-the-art learning centers, Target hopes to foster a love of learning and help more children on the path to high school graduation. Each remodeled library features 2,000 new books and a complete technology upgrade including iPads, interactive white boards and more. Each student also receives seven new books to take home! The Target School Library Makeover program is part of Target’s commitment to helping more children learn to read proficiently by the end of third grade. As a result of programs like this, Target is on track to give $1 billion for education by the end of 2015. Here’s a fun infographic that shows you a look at the life of these projects, I really love this program! Yes, I have a home library…i just wish I could style mine like your shelves….shelves always seem to be my downfall…but I love them still the same. I loved them so much I bought the teal colored ones too. Love Target. This room looks amazing! I especially love that bed frame. I’ve been on the hunt for one that is similar, but they are close to impossible to find in queen size. Also, those bookcases are wonderful. I would have totally guessed they were custom built. Wow – it looks amazing! Our home library is kind of squashed into the home office – I’d love to have a space like yours. This looks so beautiful! And simple…even my hubby & I could do this :) lovely! I love the room, the colors are beautiful! I did some built in billy bookcases in our play room. Right now they just house toys and kid books but i am sure they will be very functional as our little one grows. I love how they don’t take up too much floor space but give so much storage. What a great transformation! Love the space and I really love that duvet you have on the bed! So pretty. I don’t have a home library but I have a home office. Your guest room looks so cozy and cheerful. It’s hard when a child leaves for college and then only home for visits — you’ve made it very welcoming for yours. I like the curtain wall behind the bed, too! Very pretty. i love it! it is so cozy and inviting- a great place to nap, too! Love the entire room! I’ve been looking for a bookshelf for my living room so this was perfect timing! Now… Do tell about those drapes. They are beautiful! Thanks so much! They are from Target! 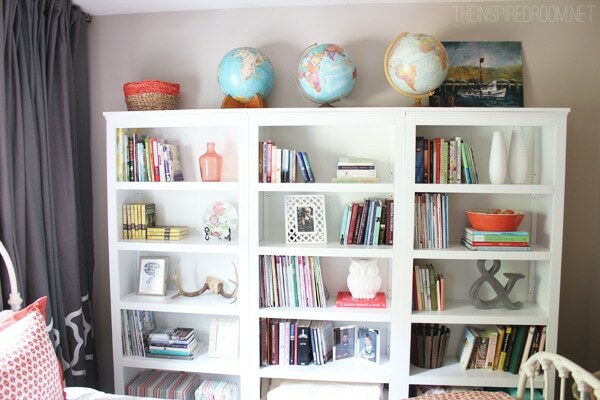 The combo of books + globes, very nice. Such a pretty space!!! Love the colors and pattern. The perfect mix of old and new! Can you share where the bedding is from? Love the orange! Thanks, the coral bedding is from Target! The bookshelves are perfect. Can you tell me the measurements? I went to the Target website but they didn’t give the measurements. Thanks! Room make overs for my daughters are some of my favorites, love that you did this together. I am new to your blog, and very much enjoy your inspiration. Oh Lordy, do we have a home library! The office/TV room has book shelves on 3 walls with maybe 1000 books? I counted one time and it was daunting. We need to completely empty that room to tear up the carpet (which my hubby accidentally used bleach on a few spots, eek) and paint the walls. I also have books in the kitchen , in two closets, wait, make that 3, and a tall white bookshelf in the guest room. I, too, love how that looks in the space, like yours. 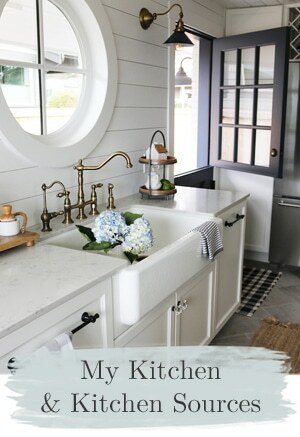 Wishing hubby and I had more energy to get this remodeling going again! I recently bought an 8-foot long, 4 ft high bookcase in one of my favorite junk stores here in Tennessee. We placed it in our family room, painted it white and the wall behind it burnt orange (we are in Vols country). I am still working on styling all the books and accessories. I have a black lab puppy that helps me rearrange and eliminate items too! Meeting you and your beautiful daughters was the one of the highlights of my trip to Seattle…keep up the great work…I’ll be reading every morning at work! Your new bookcase sounds great! That is exactly what I want for my family room, a long but less tall bookcase like that. I’m sure my puppies would take everything off the shelves too haha. Good thing they aren’t allowed in the guest room :-). I love the bookshelves but wonder how you modified the beveled tops to fit together with no gap? I didn’t have to modify them at all, they fit perfectly together side by side! I love the design of these shelves! I love your home library! Bookshelves make a space seem extra cozy to me. We have a few shelves in our living room, but they don’t hold all our books so we’re hoping to do built ins across the whole wall, which I’m excited for. Can’t wait for more details on the room – it’s so pretty! In my previous home I had a wonderful library. We are currently in a rental and searching for our next home to settle into. On my priority list is built-ins for my library. You’re Guest/Me room is fantastic. I love the fabrics and the pop of cool blue that you get with the globe collection! Also, the vintage shaped iron bedframe gives that perfect touch of cozy. What a beautiful, cozy space!! 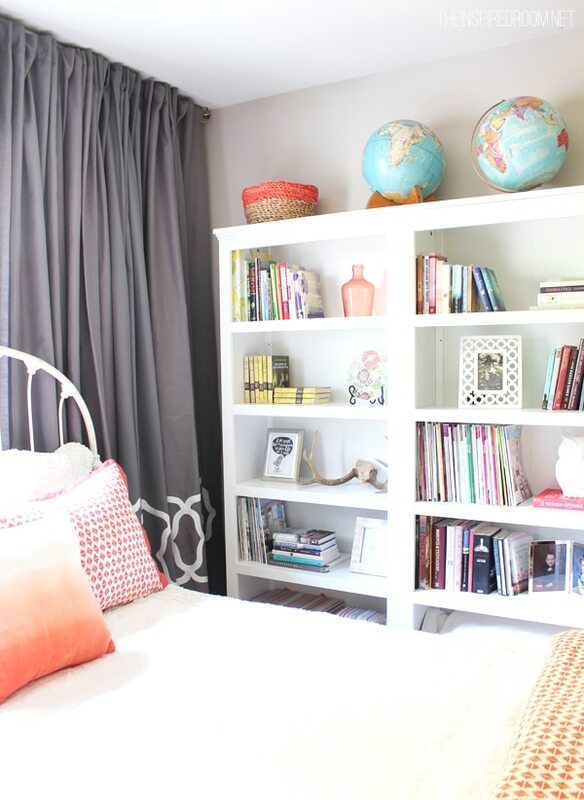 I love the book shelves and the way you styled everything…I just want to curl up in that bed for a day! I wish I had a home library! I had one growing up that doubled as an office. We have a spare room that is used as a guest room. I wish there was some way of using it as both a library and guest room. Melissa, your guest room is just beautiful. I love the bookshelves and the globes on the top. I have a set of 3 large bookshelves in my living room. They are not styled as they are about 95% filled with books. Of those 95%, about 75% are leather bound volumes I inherited (and love) from an uncle. One of these days I would like to purge the non-leather books and add objects and art to visually break up the collection and make it even more lovely. The largest obstacle holding me back is the confidence! 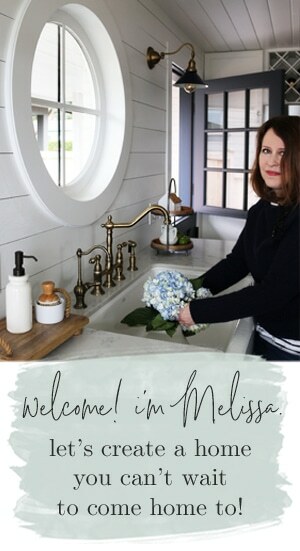 This is really pretty, Melissa! I love the look of built-in shelves, too. I have a lot of books and decorative elements I can’t display b/c I don’t have bookshelves in my bedroom. One of my projects in the next year or so will be to redecorate my bedroom, and bookshelves are a high priority. Hmmm. Not sure. Does 24 bookcases filled to overflowing counts as a home library? Never enough room for books here! We may not have nice clothes or drive a nice car, but we have BOOKS! And we feel very blessed indeed! 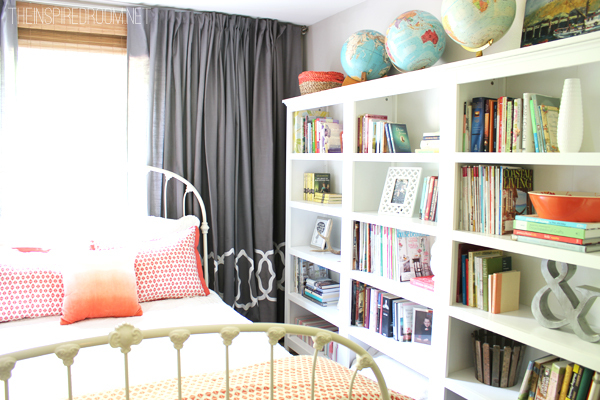 I love the idea of bookshelves in the guest room! I’m going to tuck that idea away for the future, when we’re able to have a dedicated guest room, someday. Yours looks very inviting. It’s always fun, as a guest, to have a selection of books to peruse during a visit! And it makes the room seem homey. We made our living room into a home library — two whole walls of bookshelves, filled with wonderful books! Similar to yours, they came unassembled, but fit together perfectly and look like built-ins. One other wall is a large floor-to-ceiling window, so we get lots of natural light in there! We put four armchairs around a round coffee table in the middle of the room, and the whole room can be closed off with French doors, making it a great place to read, write, play games, or have a conversation. That’s especially helpful in our full and busy household of eleven! 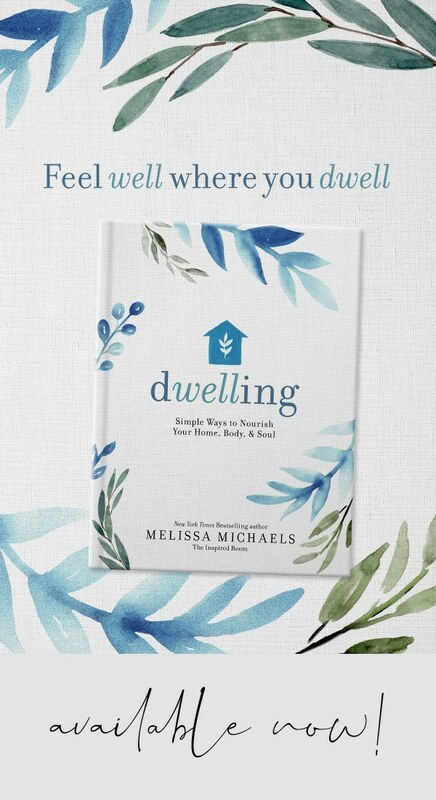 Melissa, I love the Target bookshelves. Your guest room looks great! What beautiful bookshelves! Having a home library is a must in my opinion! :) Thanks for sharing! Hi Melissa. The room looks great and I love your bookcases. I have a built-in bookcase in one of our guest rooms too. I haven’t gotten to do this room yet, but I will look back on yours for inspiration. Thanks so much for sharing. I love all the bright colors and the globes! We have a room that should be a dining room according to our house plans. Having no need for said room to serve this purpose, we outfitted it as a library/wine room. It’s dark, cozy, rather pub-like. We have chairs for reading and sipping, dark blue-green paint on the walls, and books and wine stashed into a large hutch. Not wanting to convey it is a dining room used for another purpose, there is no centered ceiling lighting. Rather, we have sconces that look like candles set on the walls and a small iron chandelier that hangs down in front of the windows next to the most comfortable, and well worn leather chair. The guest room turned out fabulous and those shelves look SO LUXE! Melissa! What a beautiful space you’ve created!! I cannot believe those are simply three stand-alone bookcases placed side by side. That Threshold line is really something, isn’t it? Thank God for Target! I love the mixing of books with elements of decoration , it is less sad than just books ! btter for the eyes. I LOVE these book shelves. And I love that they look like one unit. I do have a home library, we are big readers. Looks fabulous and I love, love, love those globes! Hi! This room turned out beautiful! Just a couple of questions. Did your curtains come from Target too? If they are I wondered if you had any problems with the design lining up. Also, how many panels did you use for your window? Is there a good rule on how many panels should be used for larger windows? 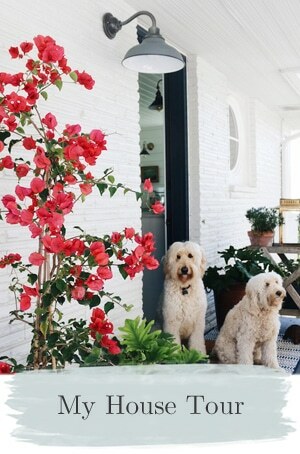 I love your blog and your home is gorgeous! Yes, actually it’s such a small room that the left side of the room opposite the bookcases (the closet doors) are in the before picture and all that remains is the door side! I do have a really cute cabinet though to the left of the door that I want to show but I can’t figure out how to get the doors put back on after we painted it :-/ so it’s in process :-)! I may just show it with the doors off :-). 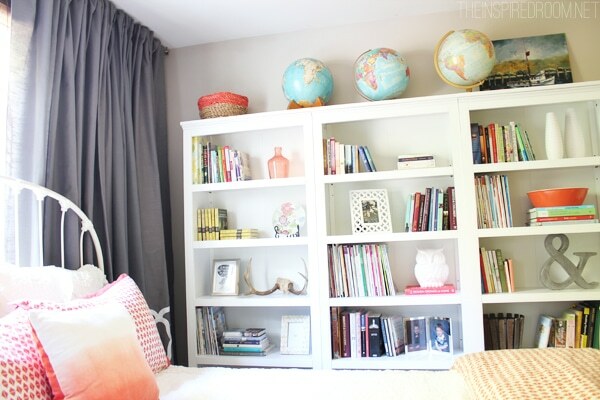 Love the way you have decorated the bookshelf Melissa! I have a brown bookshelf and have been wanting to paint and decorate. I’ve got inspiration now :). Thanks for sharing! Hi Talysa! We just mixed small amounts of white paint in to the gray paint! 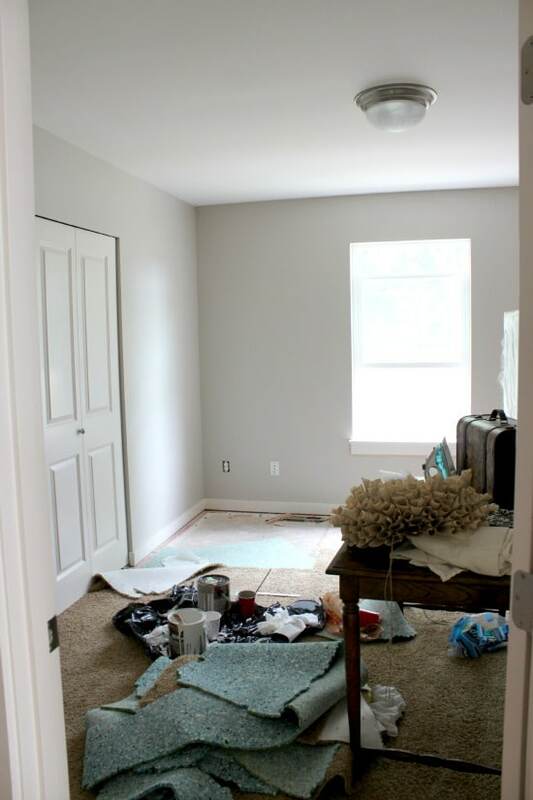 We measured it out in a small plastic cup to figure out the proportions we liked best, and then used those measurements to create the paint in an empty paint can so that the whole room would be even. You can also go to a paint store and ask them to lighten a paint color by a certain percentage. They can usually show you a paint swatch book and help you find the right shade. Hope that helps! I love this look! I’ve been looking all over for white bookshelves for our home library. :) These will be perfect. Thank you! Hello! This is beautiful! So glad I found your blog through pinterest! Could you tell us where you got the bed frame from? How tall are these shelves!? The details are not on Target’s website. 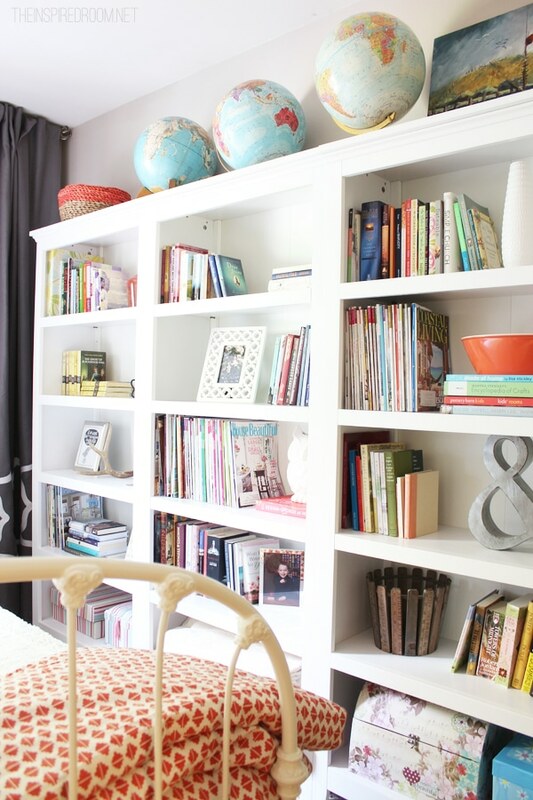 I’ve been looking for shelves like this – we don’t have a local Ikea in Nashville (believe it or not). However, we have 10′ ceilings and I want something that’s going to look proportionally okay! Hi Jaima, they are 6 feet tall! The room looks great! Any info on where you purchased the bed linens, specifically the comforter at the end of the bed? Thanks! !